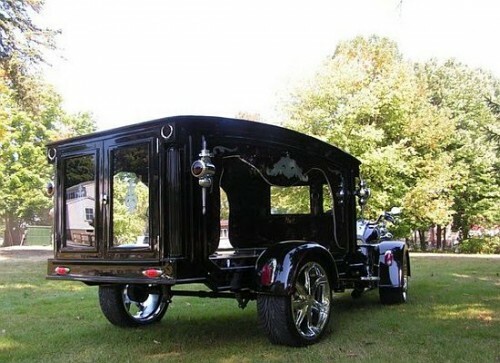 Harley Davidson Hearse Will Give You A Rocking Last Ride | OhGizmo! By David Ponce on 03/28/12 • Leave a comment! So the thing about dying is that it’s not fun. What with all the not being alive and stuff, you’d think less people would sign up. And yet here we are, all bound to have to take that sad last trip to the cemetery. 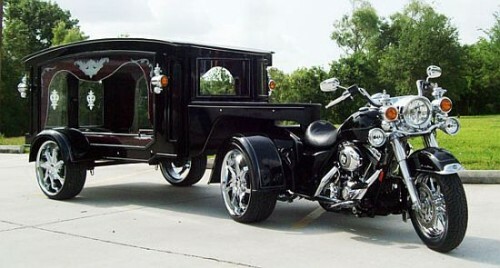 Joerg Grossmann from Germany likes Harley-Davidsons, and has seen it fit to develop the bitchin’ hearse you see pictured above. If you like to live the rock and roll lifestyle, this here hearse is the way to go. Joerg has made a business of renting out his original hearse (at $1,600 a ride), but the interest is so high that he’s now taken 10 orders to deliver them to eager customers. At $78,000, it’s not exactly something that you’d by for personal use. It is, after all, a hearse. So as an investment for an… alternative kind of funeral home, it’s not that bad an idea.